This year, marketers were focused on promoting their owned corporate website. Of the few that promoted engagement with social ads, even fewer integrated paid, owned, and earned. With 39m American Oscar viewers in 2012, a majority of them are viewing them with a second screen (mobile/laptop/tablet) in hand, disappointingly, most TV ads failed to use paid media to trigger these discussions, indicating that Converged Media of paid owned earned is not consistent in today’s marketing quiver. A few weeks ago, we conducted similar analysis of SuperBowl ads, and found a greater degree of integration, including cross-channel integration with Hashtags (31% incidence) from TV ads to trigger online discussions. 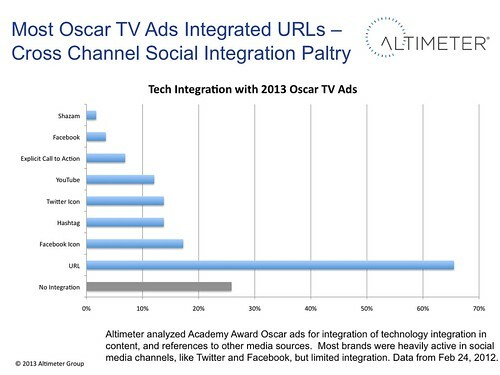 Last night, at the Oscar’s, integration from the 58 TV spots to the second screen was paltry at best, with a high reliance on advertising corporate URLs, an odd play given that most know how to use Google search to find websites. While many a brand was active in emulating Oreos “Real Time Marketing” by using pre-created photoshop templates, it felt contrived and forced. There’s a thriving discussion, from Jay Baer on the contrived impact of Real Time Ad Failures, and David Armano gives pause to share his perspective as an agency working with Kellogg who were deploying real time ads –despite no TV spot. We analyzed 58 TV spots, from award kickoff to end (not red carpet). While 17% of ads integrated Facebook, and 14% Twitter, they didn’t promote a specific URL, most focusing on the social network icons. Samsung pushed the hashtag #galaxyatwork four times across their many ads, and purchased promoted trends on Twitter. This year’s Oscar ads were contrived, forced efforts of brands and agencies running after the Oreo’s halo from Superbowl. Of note, JCP connected both there emotional TV spot, and tied it with Twitter engagement and even sent gift cards to Twitter followers that gave a positive reaction to the ads. Kellogg’s Special K deployed real time images in salute to award winners (Life of Pi), even without a TV spot, which limited their overall reach and opportunity to trigger engagement. Stella Artois had several photoshop templates that created Gifs that recognized winners, but didn’t push the content to the next level. AdWeek highlights how Oreos extended engagement from Superbowl to Oscars. 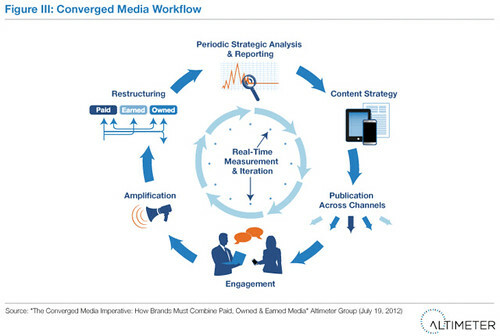 Above Diagram: Here’s one way brands should be integrated paid, owned, and earned, in a Converged Media manner. While most Oscar ads failed to complete this, JCP earned high marks, Read the full report. Real time marketing was experimental at best, with many brands still trying to develop their playbooks for the second screen. Brands failed to integrate their paid media with social media, missing out on opportunities for the content to engage and resonate. Next year, expect greater integration between all the elements of paid, owned and earned, which we call Converged Media. Update: There’s a discussion on my Facebook page, critiquing the ads.